Bywaters, a recycling and waste management company, has improved productivity by 4% using Pentaho data integration and business intelligence software. Sasha Korniak, head of analytics and data science at Bywaters, masterminded the project at the family-owned company, which operates nationally, and includes Nandos, Guy’s and St. Thomas’ Hospital, and BNP Paribas among its 2,000-plus customers. “I wanted Bywaters to embrace a data-driven culture that would give authority and confidence to make autonomous decisions substantiated by credible data and enable consumers to increase recycling and sustainability,” says Korniak. The firm was using waste management software Isys, and Korniak found the reports the system exported to Excel to be of limited use. “Another issue is that we are a very process-driven organisation”, he says, tending not to reflect the reasons behind the processes. “We wanted to move from process-driven decision making to data-driven decision making”. And so, Bywaters has created a system called Brad - Bywaters reporting and analytics dashboards - that has three types of reports: executive dashboards; ad-hoc, ready-made (standard) reports and ad-hoc, web-based data discovery. Bywaters also has a web-based customer portal, initially in use among 60 customers. Brad has been created using Pentaho software. Korniak looked at alternative technologies, he says, but “cost was a factor. We are an SME, a family business, and Pentaho’s being open source counted in its favour”. He reviewed Microsoft’s customer relationship management (CRM) and business intelligence (BI) tools, as well as SAP's software. Both were cost prohibitive, he says. 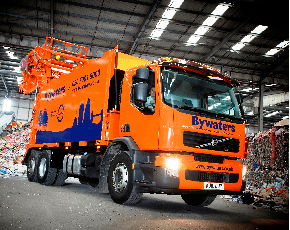 Bywaters uses a two-bin system, for dry and what the waste management industry calls "residual" rubbish that cannot be recycled. Korniak says it is cheaper for a customer to recycle than to pay to have waste incinerated. His firm wants to highlight to the customer that it is more effective to separate waste at source, and recycle more. “Using Brad, a customer can do trend analysis and identify anomalies in respect of recycling percentages,” he says. And the purer the recycled product is, for Bywaters, the more it can gain an advantage over competitors, such as Biffa. “We are no longer just a waste management company, we are a waste consultancy, improving our customers’ recycling through providing the data”, says Korniak. “If you are not data driven, but just go out and collect bins, the sustainability of your business will be damaged”. One factor that caused the firm to re-think its approach was the closing of China’s borders to recycled product in 2012, due to poor quality. “The only way to get [customers] to change their behaviour is to give them data," says Korniak. Bywaters has bought the professional edition of Pentaho, with its report designer, analyser, and dashboard elements. “Now, our drivers, who use PDAs are able to tell us there is, for instance, blocked access. We can tell the customer straightaway, providing a photo," and the issue can be resolved quickly. The firm purchased a “deployment assurance package” from the supplier in August 2012. Korniak relates how Isys was deployed in February 2012, and reports were delivered out to Excel until September, and took some three weeks of every month to manually prepare and digest, using 9 to twelve pivot tables. Once the Pentaho system was deployed, customer reports were, by November 2012, being automatically produced in “less than 90 seconds”, using its ETL [extract, transform and load] and report design capabilities. Korniak estimates a 4% increase in productivity in the year or so after deployment, since Bywaters “can service more customers with the same operational resource”. And he confirms a 6% increase in profitability. At present, the Pentaho system feeds off data from Isys, the company’s CRM database, and its materials recovery facility machinery, where the recycling gets separated. The firm plans to integrate its HR and finance databases, partly to set up predictive analytics. It also wants to move into big data, using "smart dust" - nanotechnology that tracks the location of waste. The underlying data warehouse is based on Microsoft SQL Server 2008. Korniak says he wants to see greater interactivity with customers, “where the data warehouse is less a repository than an exchange”, and, where, as an example, a customer could report blocked access ahead of time. "This means our business can grow based on the information we get, and not on assumptions".